Yes! Its my Peerie Flooers! This hat, along with a couple of my other designs, will be making their first TV appearance tomorrow in Shetland, a two-part BBC crime drama based on Ann Cleeves’ novel Red Bones. Exciting! You can see some more stills and the trailer here, and, if you are in the UK, you can watch the first part of Shetland tomorrow night at 9pm on BBC1. Just catching up… Isn’t that a monochrome Puffins jumper on Hattie in the bar scene where her professor is dancing with another girl? And maybe you can help me find the pattern for that beautiful gold cable-and-texture pullover that Tosh wears toward the end (welcome relief from that hideous white-and-red blouse)? I was watching this show for the first time and screamed “Peerie Flowers!” I actually paid attention during the closing credits waiting the designer name to be listed. I guess the hat was just a “extra” but for me it stole the show. 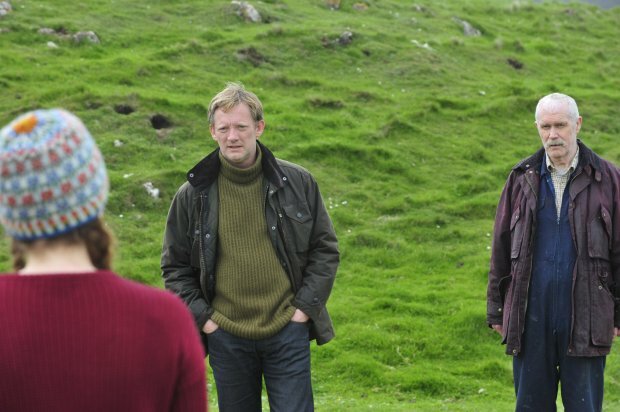 Shetland has finally aired on PBS in a two-part series in New England. Unfortunately, the script did not live up to the book. However, I was amply rewarded by seeing your knitwear on some of the actors. I also enjoyed seeing the landscape of Shetland . . . I spotted it and yelled “Kate Davies is on the telly”, was so pleased for you! however it was 3am and only my mog heard me. I did then wonder if you’d made ALL the knitwear… +1 to Becky, you should have got creds. Huge congratulations, wish you better. I was very excited to see Peerie Flooers on TV! It demanded a pause and rewind as I made my OH admire the knitting. It was a bright ray of sunshine in the sombre Wallander film style, very welcome and so much fun spotting the knitting while you unravel the plot. The hat should have been mentioned in the credits! Congratulations, I am so happy that all your talent and hard work are getting well deserved recognition. I live across the pond and so shall be waiting impatiently for our PBS stations to purchase Shetland. I am so sorry to hear that you are not feeling well right now. Rest, take good care of yourself – sending you good wishes. we can watch BBC here too, it was great… congratulations..
I’m SO happy for you Kate!! Your hat looks amazing…on TV or in real life…did you knit that one?? Oh…so sorry to hear that you are not well…sending you good wishes from the not so sunny (today) West Coast of US…take care!! Thought the hat looked familiar. Didn’t realise it was an original! I’ve had a picture of this hat from a magazine in my to do list and spotted it on TV-recogised it and thought time to do it. So here I am buying the pattern! I saw the show not having seen this post and thought, lovely hat. No wonder! Congratulations, Kate! They look superb. I thought I recognised the hat! I hope you’re getting some peace, and recharging your batteries after the past few hectic months. I expect it’s caught up with you, so cuddle Bruce (and Tom) and sleep! Bodies, eh? Kate, I hope you feel much better very soon. You’ve been doing a LOT lately. Bruce, take care of Kate. How exciting! I hope you are feeling better – this rotten weather won’t be helping! So I was watching the programme and thougth – I recognise that hat – it looks like one of Kate Davies designs…. they are beautiful and I am working up the courage to try one out. 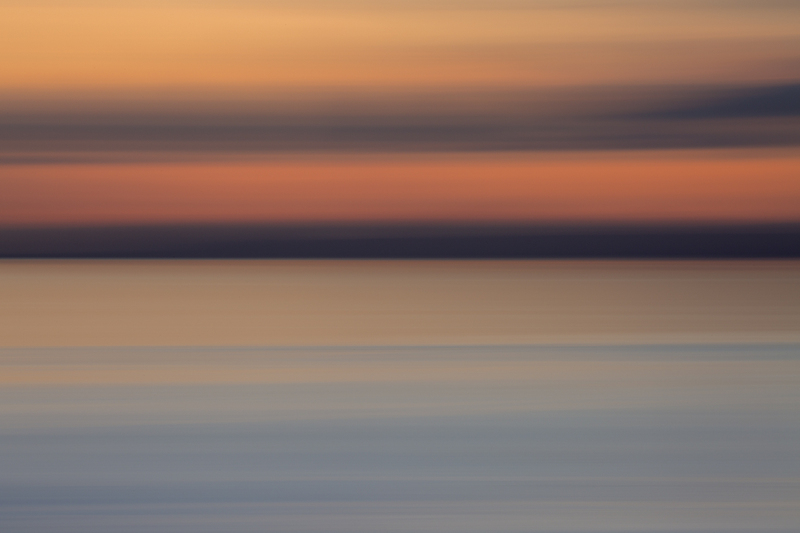 Off to Shetland in October so may meet you then – hope you feel better soon. So sorry you are not well, Kate. Like almost everyone else here (the UK based contingent at any rate!) I was watching last night, pointing out your designs to long-suffering husband! When you feel better and have a minute, I would love to know more about how Peerie Flooers & the other designs ended up “cast” in the programme. For example did someone (you?) knit the patterns up again specially? kate, how you are feeling better soon! It was fabulous to watch last night – watched over a wonderful VPN service … email me privately for name if interested. cant wait till tonight to watch the conclusion. it was great seeing your hat – as i was working on my own adaptation of the “we are pirates” hat for my nephews. fair isle and shetland on tv,,, bliss! just wish the series were longer… may have to have a few rescreenings to savour the deliciousness of Mr Henshall and that SCENERY … sigh can i move there please? I made my family sit down and watch ‘Shetland’ last night just so that I could bounce up and down squealing ‘That’s Kate’s hat! !’ at the crucial moment. SO exciting! I thought the girl in the bunnet looked quite like you from the back in fact. Makes me appreciate the global village of the internet – had heard about the programme through FB contacts in Shetland too. Still haven’t got further north than Orkney but this renews our determination to get to Shetland before too much longer. Hope you are on the up again soon – may this wee spot of fame boost your spirits. In my own case of neurological disfunction, I find it helps to remind myself that a backwards lurch in the recovery business invariably means that the brain is working on an imminent jump forward. All the best to you. Hi Katie – I’ve been following your blog now for quite a long time and am delighted that your designs are included in Shetland…My tapestry is too! I noticed the hat in the show and admired it before i knew it was by you! I hope you are feeling better and I’m going to look forward to seeing more of your work tonight! Good for the BBC too – redeeming themselves after broadcasting a nun pretending to knit a crocheted square in Call The Midwife immediately before Shetland aired last night. Get well wishes to you. I am sending you love thinkings, hoping that these joint the other wishes from people that admires you and make you feel better, to enjoy enterely the sucess of your creative endevours. I shall find out soon enough! Just watched the first episode of Shetland and think its beautifully done, the scenery of course is gorgeous, some great knitwear too, but especially your Peerie Flooers hat which stands out as extra special! Hope you soon feel better! Please feel better soon. I hope the sight of your beautiful hat on television helps you. On another note, I purchased Colours of Shetland yesterday and I am itching to start knitting! Drop dead love that hat. And sigh, another not-to-be-missed BBC production which we will. Also –totally stricken not to be able to get BBC 4 Radio. you can get BBC Radio 4 and all the other radio stations, they stream over the internet to the entire world. just go to bbc.co.uk/ and select RADIO. you can even listen again to 98% of all programs via their website as well. i listen to radio 3 all day at work on my iphone via iTUNE a great app that is available for mobile devices of all flavor and the desktop as well (i have no computer speakers so bought a little desktop docking station speaker). Just had to tell you I love Bruce- he has the sweetest face. I have one of your pictures of him as my screen saver on my phone. Feel better soon. Oh Dougie Henshall is so brilliant, and so are your designs. I do hope your Rams and Yowes gets on the programme as I’m halfway through the blanket, what a labour of love! Best of luck and get better soon. This is brilliant – not least because if people are smitten by it, they will have to learn to knit to get hold of one, rather than just going to shop to buy one… like happened with that famous Scandinavian crime series sweater. Oh wow! This is great! I’m so happy for you Kate! I hope you feel better soon! My thoughts are with you. Oooh I shall go Kate Davies Designs spotting! Been looking forward to viewing this series very much! Love your designs! Love the Ann Cleeves series! I wish that we could see the series on American TV right now, but know that we will probably have to wait, as we do for other series from the UK. Still, I’m glad that your hat and the series came together. Congratulations! And, I hope whatever is ailing you resolves itself soon! So excited for you! Get well soon. How exciting seeing your hat on telly! Looks like the show will be worth watching just to check out the cliffs! Were I in the UK, I’d be watching for the knitwear–well, OK, I do love a good mystery too. I hope you have time to take very good care of yourself so you can heal up. In my experience, one is always behind on something. Best to just tolerate the idea of always being so in one area of life or another. Very exciting Kate! Congrats. I hope we can watch it soon in the US. What an absolute delight for you. May those westerly winds blow good health to you! How exciting for you!!!! Reading this very book at the moment…awesome author! Rest, rest, rest, tea, good company and watching BBC1 should help…I hope…be well soon. You must be very proud of your work. Looking forward to the programme and hoping you are soon feeling much better. Take care of yourself. How exciting for you Kate! They have even done her hair in braids. 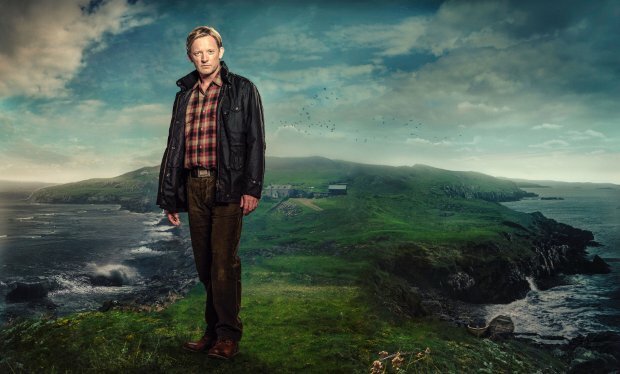 I’m really looking forward to watching ‘Shetland’ on telly tomorrow evening – having once visited Shetland I’m really interested to see the scenery of that magical place. 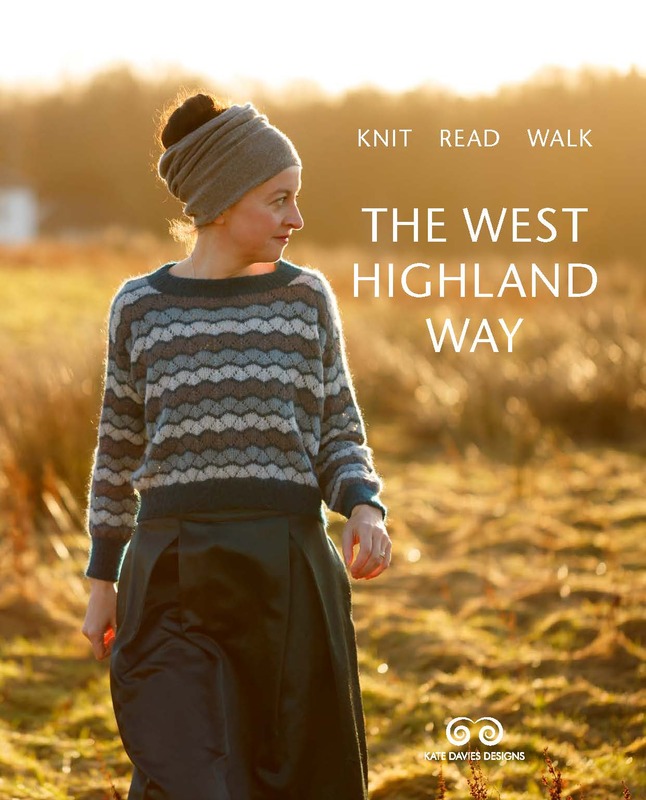 I’ll certainly be keeping a look-out for your knitwear, too – how wonderful, and appropriate, that they’re going to be wearing your designs in a Shetland-based programme. Hoping you’ll soon be feeling much better. That is so great to be featured on a BBC mystery! I am sorry that you are not feeling well, you know I send you all the best and hope you have your vim and vigor back as soon as possible. t get any good shows. Feel better. How exciting! I wish you a speedy recovery. How exciting! I’ll be watching it! Get well soon. Take care of yourself, Kate. It’s been a whirlwind lately, with the book and the move. Forget feeling responsible about return emails. And watch Shetland with Bruce curled up next to you and feel proud indeed! Hope you feel better soon, Kate. Congratulations Kate!!! So happy to read this, you deserve it!! Pretty exciting, Kate! But tell us, did you know your hat would be used? Did they have to get your permission or did you simply stumble across it. Agree with Josephine..love your blog. I would like to make the sweater at the top of your blog, but steeking really scares me. Yes, I know it can be done; has been done successfully, but cutting my knitting after hours of work just scares me. How exciting!!!! I hope we can watch this in America soon. I read the first two books of this series (after reading about this author on your blog) and will soon start the 3rd. Can I just tell you Kate that I love reading your blog, looking at your pictures and making your knitwear designs. I am going to make one of your hats as soon as I finish a sweater that is taking me forever!!!! I did my first steek using your Blaithin pattern and I made the owls recently. You have inspired me to do a lot more color-work knitting – I’m getting better and better at it. Take care Kate, and I hope I can watch the series on my BBB-iplayer app. It will be great to see all those lovely locations in Shetland. How wonderful to see your work on telly – I hope you feel better soon. I’ll look forward to watching it soon in the US as I knit my Scatness Tam. Your adoring fans (me and 2 corgis) hope you feel better soon. I wondered if you might be ill….rest and take care of yourself (really bad at the first part myself). Shall definitely watch the show – murder and fair isle knitting! What’s not to love? Just take good care of yourself – if you were not able to design and blog the knitting world would be dreary. Please take it as easy as you need to in order to recover. Thinking of you and thanking you for your wonderful work and terrific blogs. Oh Congratulations! How exciting!! I’ve been looking forward to this mini series too. Hope you are feeling well soon. love to read new mystery authors, just chose the Shetland series for my Nook, takes too long for BBC programs to reach Bellingham WA. I hope PBS will bring this to the States (otherwise we’ll have to wait for BBCAmerica, which breaks for commercials). Your Peerie Flooers will make it even more compelling. Congratulations, and get well soon. I look forward to carving it in the US too. How many designs did you contribute? I’d love to hear more about this and how it all came about. Hope you feel better soon. We always look forward to your posts! Great news on the hat. I love my version of the hat and now it’s going to be famous! I may even be classed as trendy!? Get well soon! Sooooooo exciting! You must be so happy to see your designs used like that! Sorry to hear you’re unwell…hope you’re feeling much better soon. How exciting to be on the tele. email will wait while you take care of yourself. Sorry you are unwell Kate. Hope you soon feel better. I’ve already been trying to spot your designs on the glimpses I’ve seen of the trailers on tv so far. Take care, Kate! May full health find you soon! How cool! Sorry to hear you’re not well, though. Hope you’re better soon. Wow – how cool is that! Hope they’ll show it in Norway, too. Oh, what fun. And how wonderful your knits are making to TV (movies are next) ! ! ! You are now a celebrity. But sad the show may never make it over the water. But perhaps we can get online or CD one day. Here is something fun for knitters: Shetland ponies in Sweaters: http://www.youtube.com/watch?v=yfybEEWnYSI&feature=youtu.be . Congrats . . .
You must be so excited to have your designs in a TV show. I hope eventually the show will be on my local PBS station in the U.S. Hope you are feeling better, please take care of yourself. At first I thought that was you, in the hat, with Douglas Henshall! Hope Bruce is taking good care of you while you’re poorly. Feel better soon. I’m excited and all I did was follow your beautiful pattern!!! Wish you better soon. How exciting to have your hat in the show! Hoping that watching Shetland will give you a boost to a speedy recovery and better days! That’s so wonderful—Congratulations! Basking in the limelight will help you feel better. How great is that hat on tv?! Cuddle Bruce. He’ll make you feel better. How fabulous about the hat!! :-) So sorry you’re not doing well: rest up and take care. I hope you are doing better soon. Make sure you get well first, then think about others! How exciting for you!!! I had seen trailers on the BBC and really looking forward to this program (and now your designs). I have had Norovirus for the last 2 weeks and hope it’s not what you have. Get well soon. It’s sounded like you’ve been overachieving a bit lately. Lovely that your garments are going out on an adventure that you can enjoy vicariously while resting and restoring. Please do those latter things for long enough to really feel well. 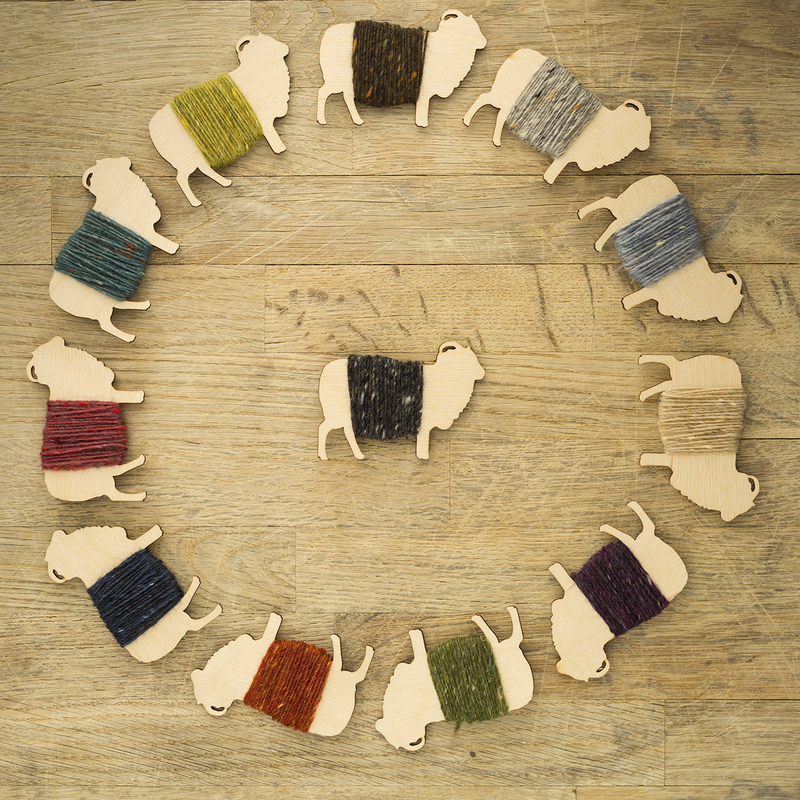 ALL of us wish you the best and we will be here when you are again ready to tackle this ‘thing’ call Kate Davies Designs that we love! Snuggle up to Bruce………that’ll help! Re watching Shetland in Toronto – can you see it on the web via bbc iplayer ? Wishing you speedy recovery. And I can’t believe there’s a TV show called Shetland–I can only imagine the intrigues! Assuming they’ll eventually do shows on all the great knitting islands: Aran, Lewis, Faroe . . . This is based on fiction written by Ann Cleeves…….murder mystery! Anne, this would entice me to get cable. Living like a mennonite myself, do you think we could get BBC1 here in Ontario via cable?? Love your posts and blog, even though knitting is not ‘my thing’ but there is some thing romantic and compelling about your work… so you ever sell your designs ready made or jus the patterns for other people to knit? Hope you are feeling better soon. Take care of yourself….everything else can wait a bit.. Congrats on the show! That is great! How exciting. Sorry you aren’t feeling well. Get better soon. That’s AWESOME! Really famous now! Hope you are feeling better!